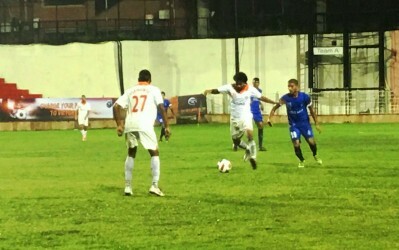 Salgaocar Football Club registered a comfortable 3-1 win over Corps of Signals in the Goa Professional League match played at Duler Stadium earlier today. The Greens made one change from the last match as injured Leny Pereira made way for new signing Guinean defender Keita Boubacar. While Saignals made no change to their starting XI. SFC were the dominant side from the start and had many goal scoring opportunities. Just six minutes after kickoff, Liston Colaco wasted a golden chance to take Salgaocar into the lead. He failed to connect from six yards after receiving a cross from Gilbert Oliveria. Two minutes later Mackroy Peixote’s cross picked out unmarked Gilbert, but his shot from close range was superbly blocked by Signals’ keeper Niyas Mon. In the 35th minute Lsiton tried his luck from distance but Signals’ custodian made no mistake to clear it. Few minutes later Niyas Mon was again in action as he made a diving effort to save Souvik Das’s long ranger. Finally on 41minutes, the Greens scored through Brian Mascarenhas, his 35-yard free-kick finished in the net. Just before the whistle Salagaocar should have doubled their lead, Brian produced a curling cross inside the 18-yard box but Boubacar’s header was far from the target. After the break Signals tried hard to level back and at last in the 62nd minute, a 30-yard direct free-kick from Lalramsanga curled into the far corner of Salgaocar's goal to make it all square. Just few minutes’ later the port side once again took the lead through Brian, as Souvik picked him out unmarked and he slotted the ball into the net. As the match progress substitute Aslon Oliveira made no mistake to tap the ball home to make it 3-1 for Salgaocar, after receiving a perfect ball from Brian. Signals tried to score in the last minutes of the match but the opposition defenders stayed strong to confirm victory for the Vasco based club. “Next three matches are very important for us as we play SSC Cavelossim then Sportong Clube de Goa and Churchill. We need to work hard now” he concluded. With this victory Salgaocar FC tops the table with 6 points from 2 outings. They next play Santa Cruz Club of Cavellosim on 3 September.